Deadnettles were @SpeciesofUK from 24th February to 2nd March, 2014. 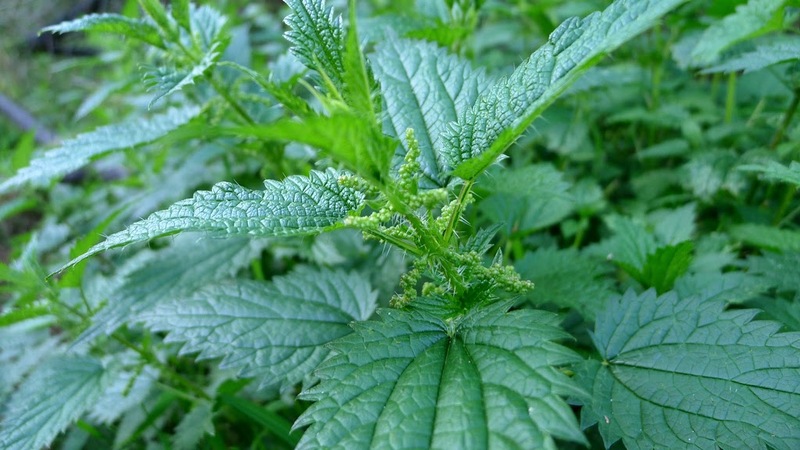 Deadnettles are forty to fifty species of herbaceous plants that make up the genus Lamium. The UK has a number of deadnettle species growing wild. 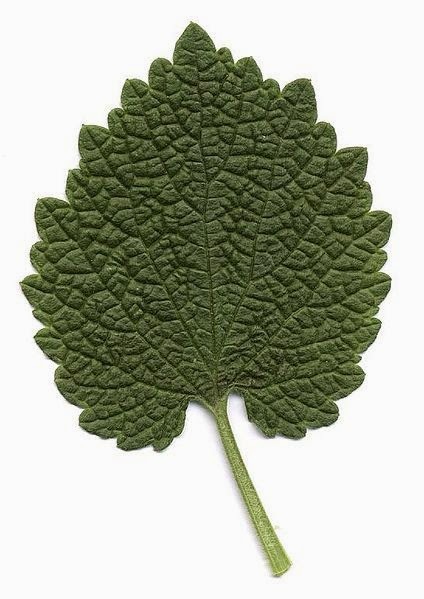 Deadnettles are native to Europe, Asia and northern Africa. Deadnettles have spread beyond their native lands however and are now naturalised in temperate climates across the world. Deadnettle species typically have square stems, coarse leaves often with striking variegation, and double-lipped flowers in a range of colours. The name 'deadnettle' comes from the resemblance of the leaves, particularly of the white deadnettle, to the unrelated stinging nettle. Deadnettles are widely cultivated as ground cover to conceal and/or protect bare earth because they can spread in dense formation. Deadnettles are also popular with gardeners, who have created several popular cultivars and like its frost-hardiness and variegation. 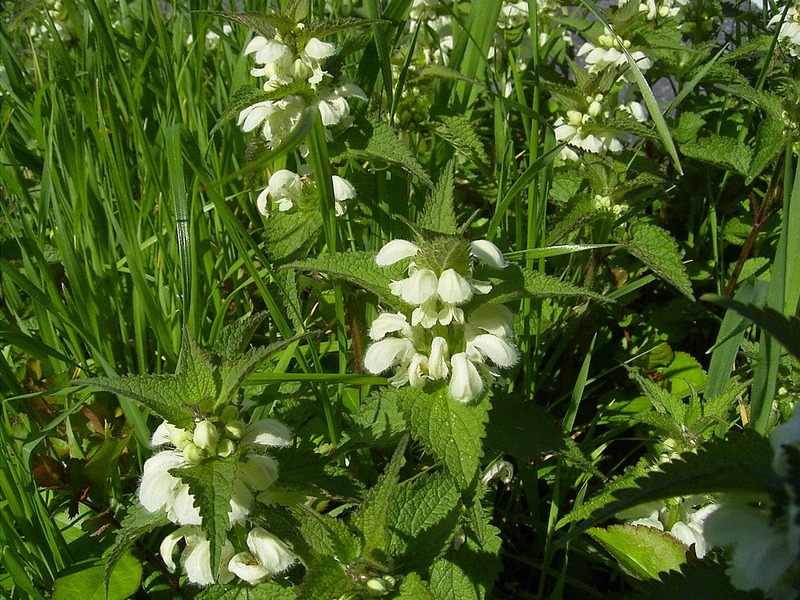 The white deadnettle is thought not to be a UK native. It may have spread with people from eastern Europe a long time ago. Today, it is common in most of lowland Britain, except for the north and west of Scotland. 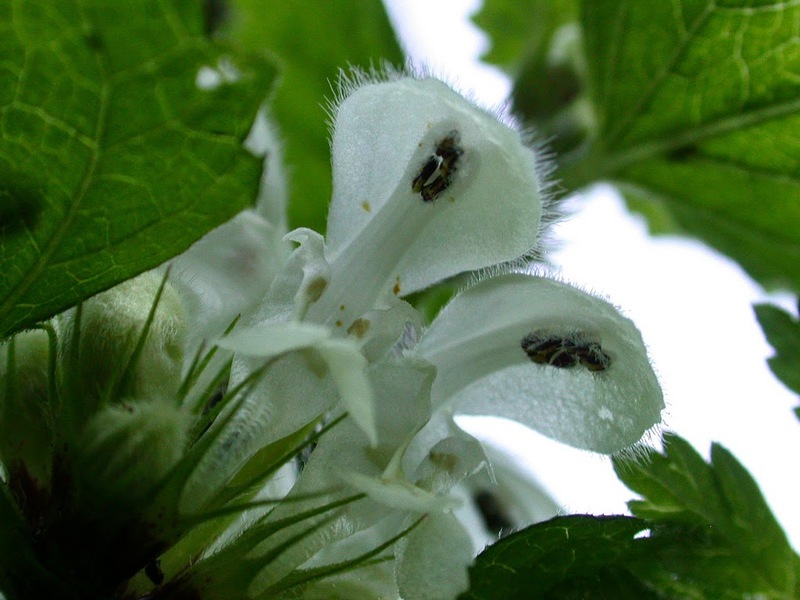 The white deadnettle has hairy leaves that are similar-looking to stinging nettle. It grows in a variety of habitats from grassland to woodland. 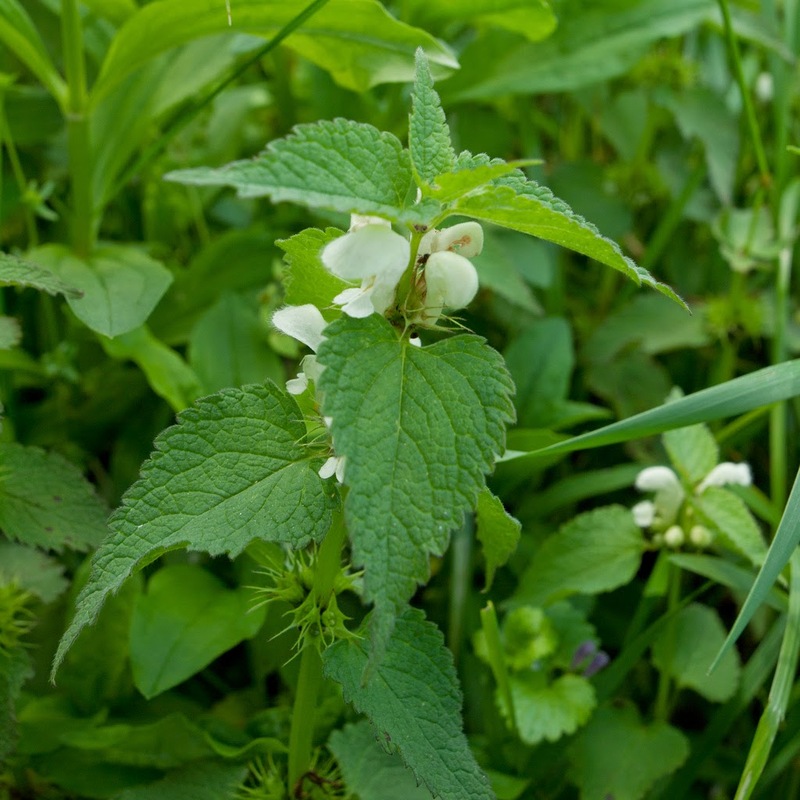 In truth it is fairly simple to distinguish white deadnettle from stinging nettle. 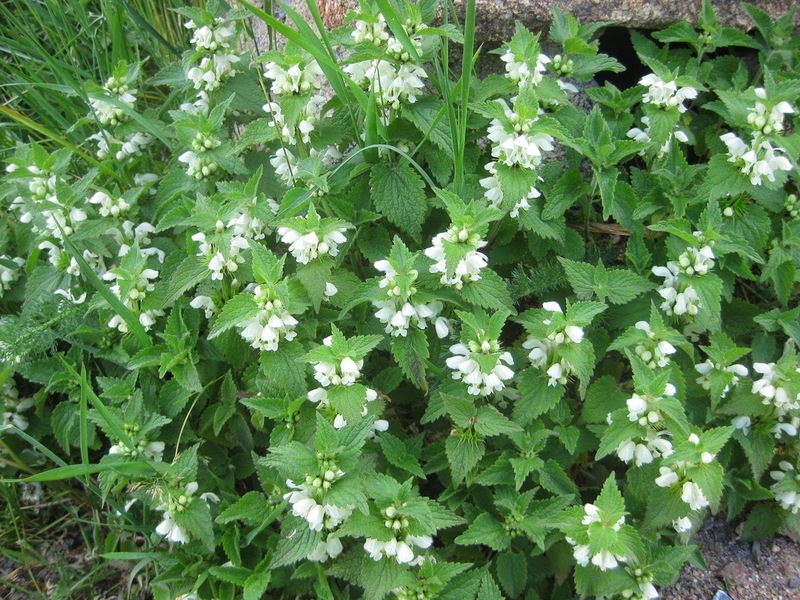 White deadnettle has a long flowering season and its flowers are completely different from stinging nettle. The flowers of white deadnettle are white (hence the name) or can be pink. They appear near the top of the stem growing to 1.5-2.5cm. White deadnettle is sometimes called the 'bee nettle' because its flowers are such a popular source of nectar for bees. 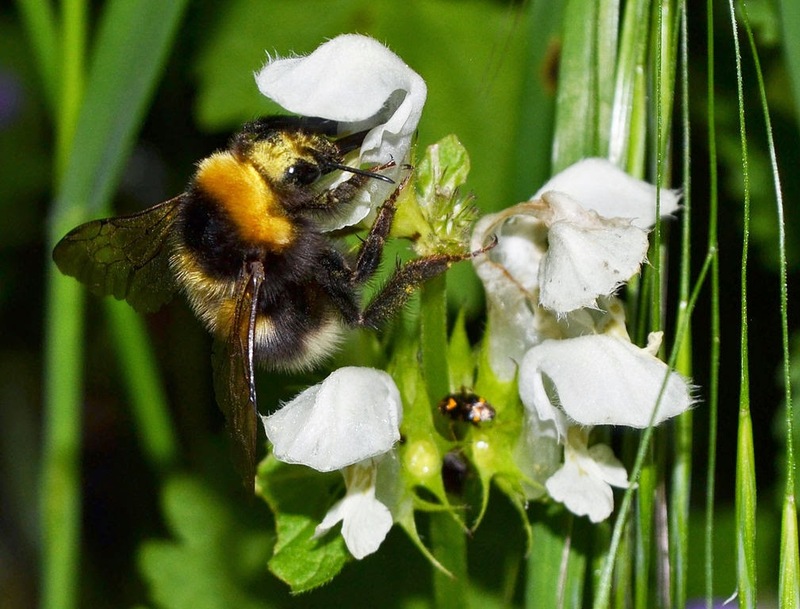 It is certainly true that the nectar at the base of white deadnettle's tube-like flowers is only accessible to long-tongued insects like bumble bees and mason bees. 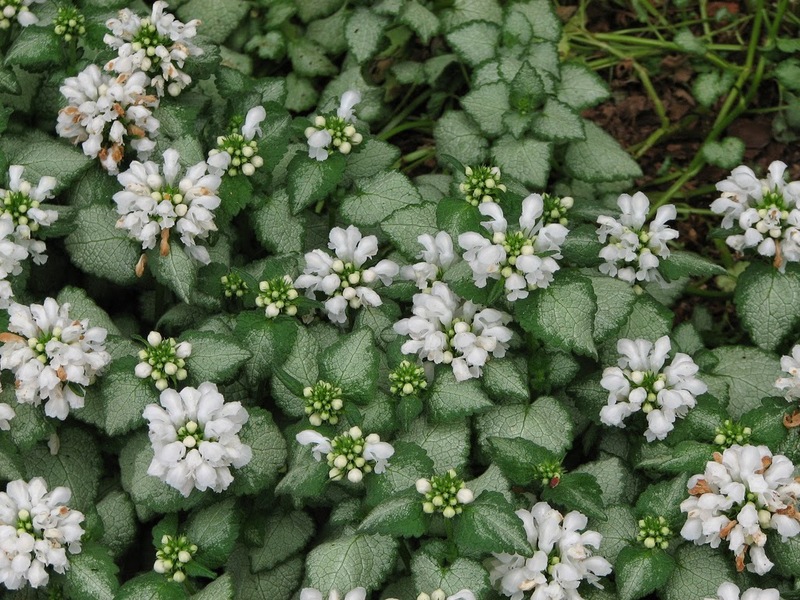 The young leaves and flowers of white deadnettle are edible. They can be used in salads or boiled and eaten as a vegetable. 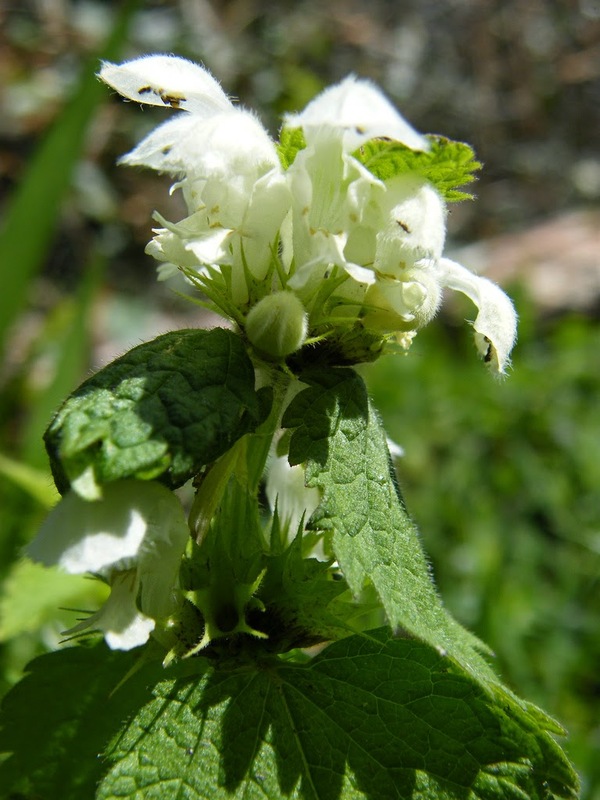 White deadnettle is also in herbal medicine for dermatological complaints, catarrh, dropsy and gastrointestinal problems. In a 1931 Herbal, white deadnettle was said "to make the heart merry, to make a good colour in the face, and to make the vital spirits more fresh and lively." 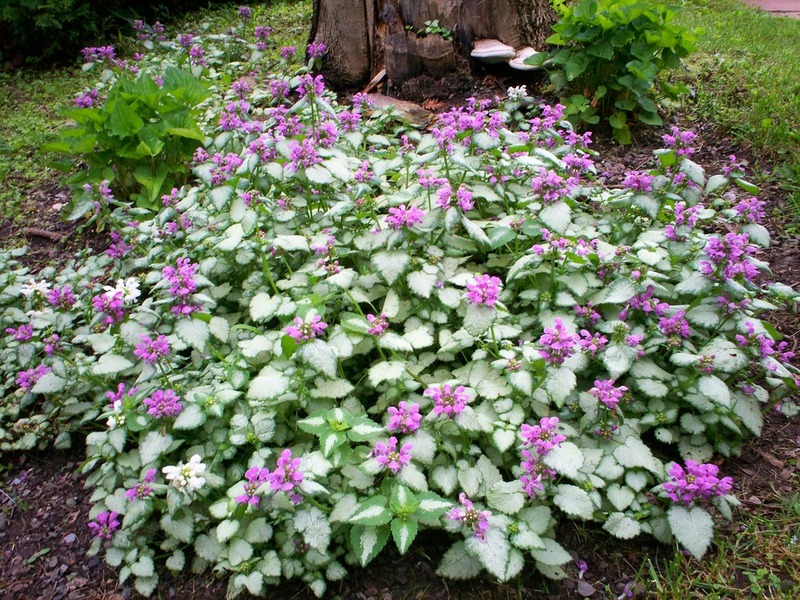 The red deadnettle is native to Europe and Asia and is common in the UK. It has bright red-purple flowers and its leaves are green shading to purplish higher up. 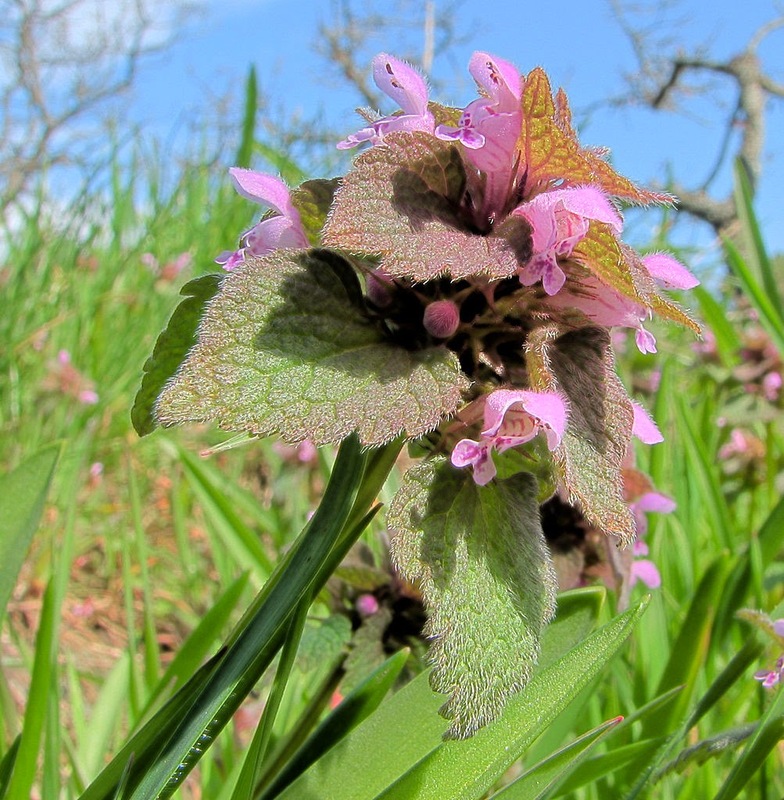 Red deadnettle colonises fertile, disturbed soils, like cultivated land, gardens, hedgerows, and waste land. Like white deadnettle, red deadnettle is naturalised in North America, where it’s considered a common weed of cultivated areas. Red deadnettle leaves are heart-shaped, shortly toothed and stalked. 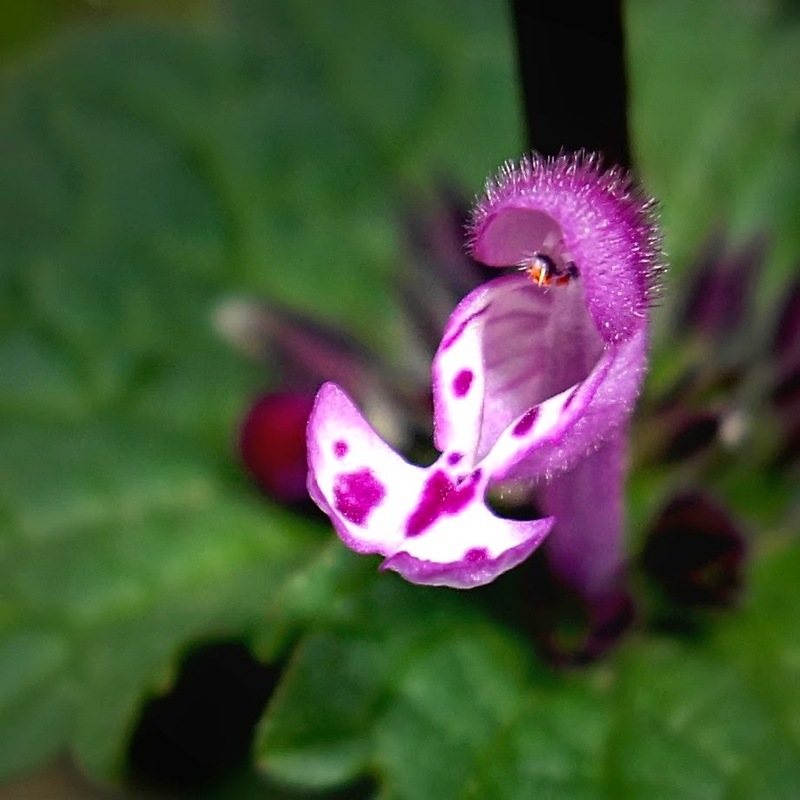 Red deadnettle flowers have a curious structure with a top hood-like petal, two lower lip petal lobes and minute fang-like lobes between. 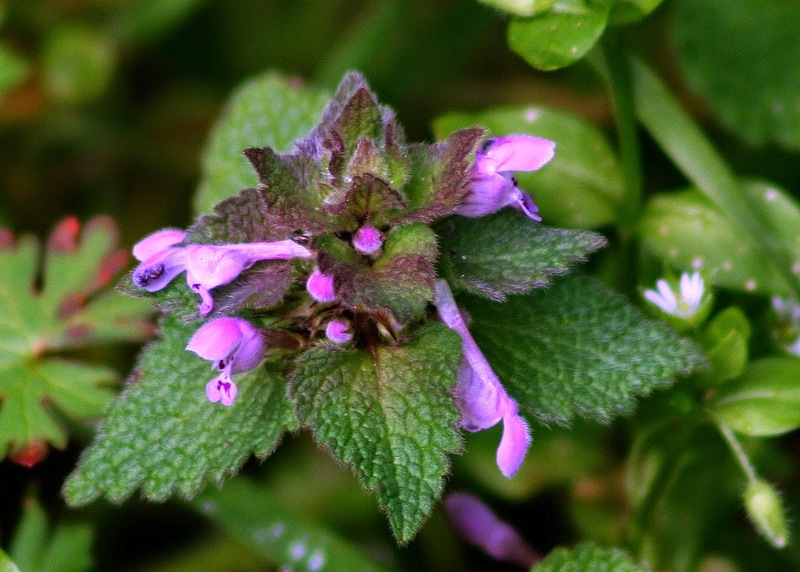 Red deadnettle flowers are known for appearing throughout almost the entire year, including during mild winters. 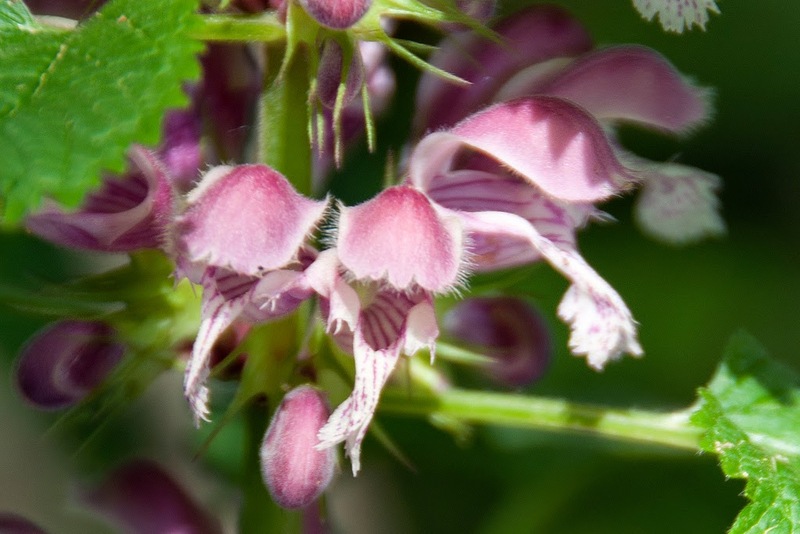 Red deadnettle is an extremely prominent source of nectar for bees early in the year when few other nectar sources are available. 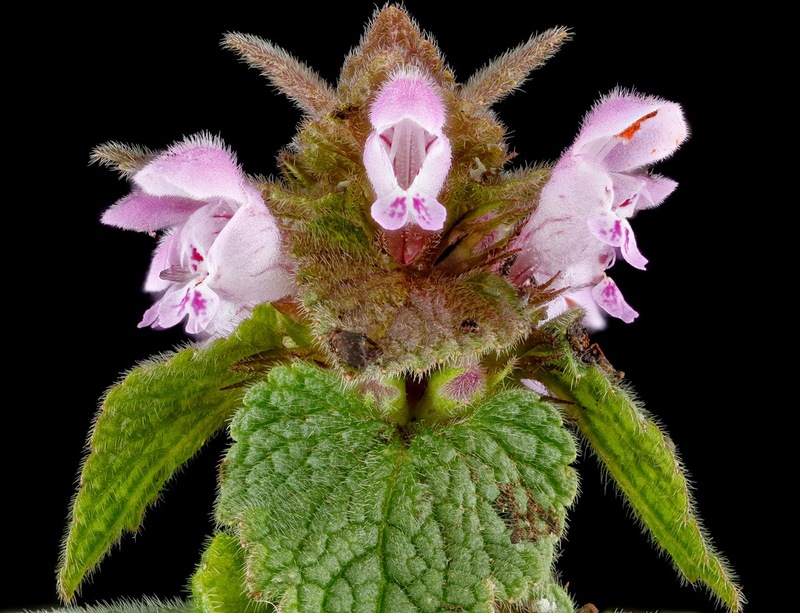 Bees are the most common fertilisers of red deadnettle, although the flowers are self-fertile so can also get by on their own. The seed of red deadnettle drops Apr-Nov. It has an oily coat that attracts ants who distribute it. Once dropped a red deadnettle seed can remain dormant in the soil for many years until conditions are right for germination. Young red deadnettles have edible tops and leaves, used in salads and stir fries as a spring vegetable, or chopped into a sauce. 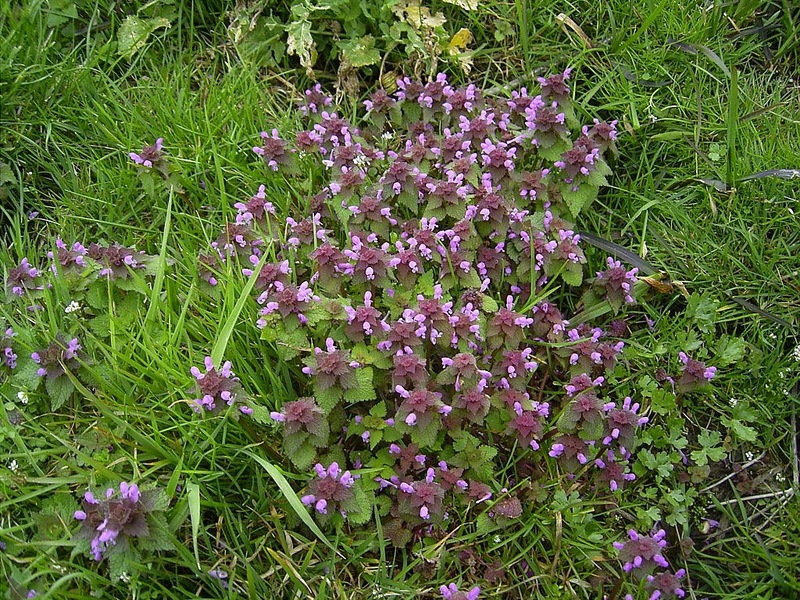 Another deadnettle that can be found in the UK is the Henbit Deadnettle. 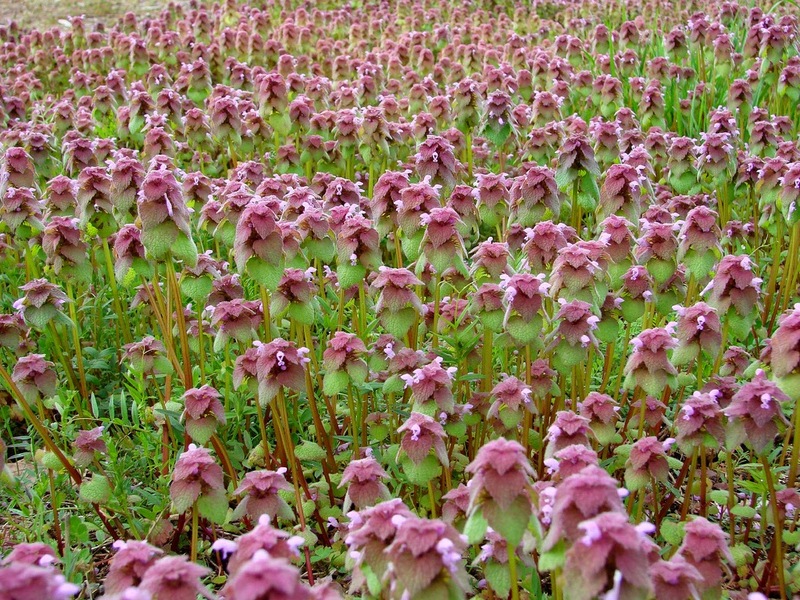 The henbit deadnettle is very similar in appearance to the red deadnettle. 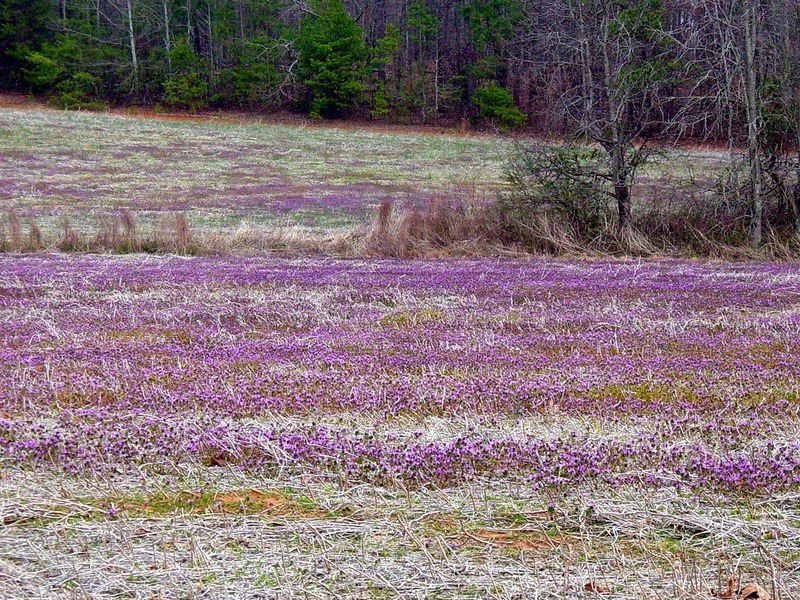 The main difference is that red deadnettle has stalked leaves and henbit deadnettle unstalked. 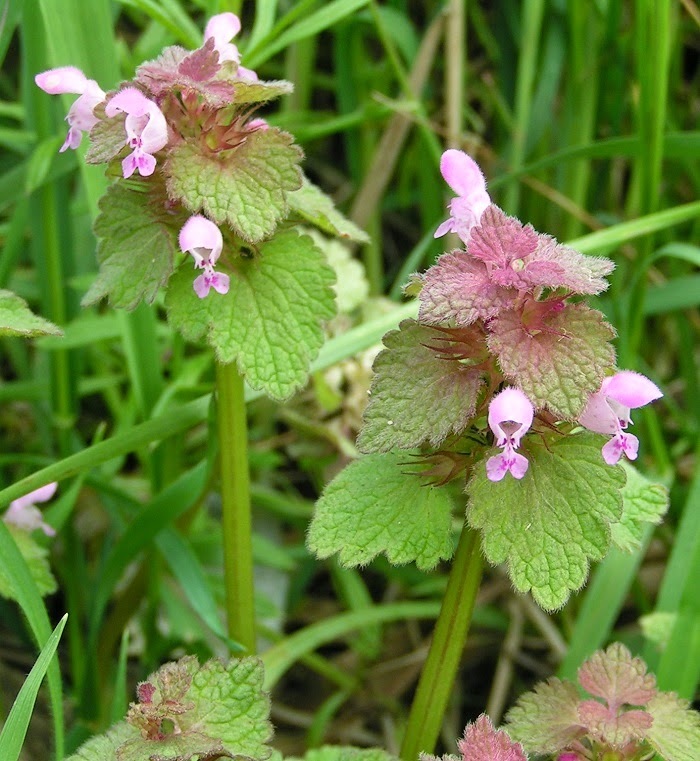 The unstalked leaves of the henbit deadnettle give it the species name 'amplexicaule'. Amplexicaul is the botanical name for leaves like this. 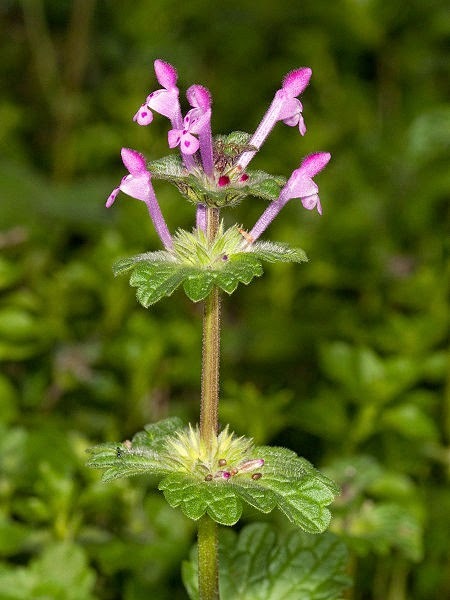 The common name 'henbit' deadnettle simply comes from people noticing that chickens like it. The same reason that chickweed gets its name. 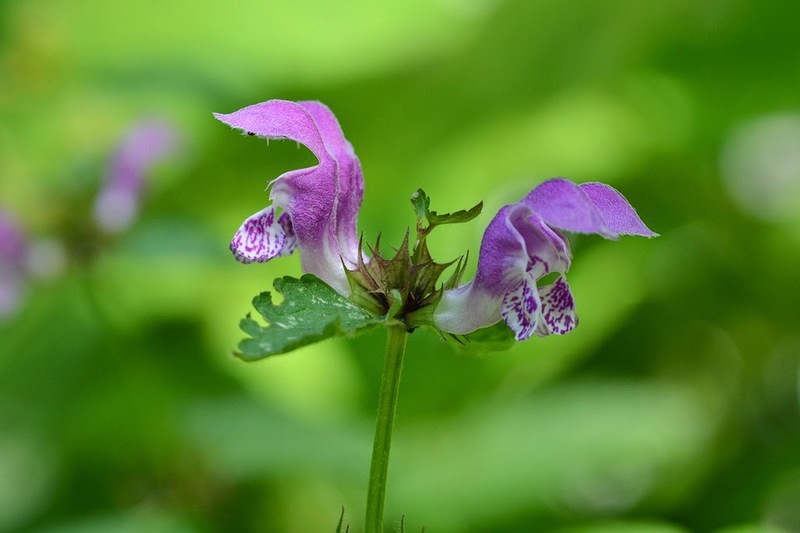 The henbit deadnettle is probably not native to the UK. It originates in the Mediterranean. But nowadays it occurs as a weed around the world. 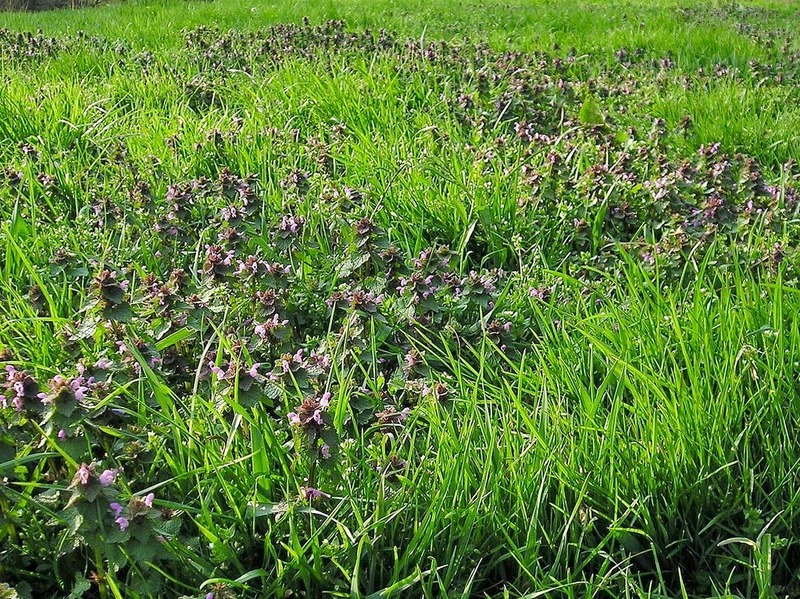 In the UK, henbit deadnettle almost always occurs due to the activities of man - in arable or garden land. The seeds are resilient, lasting for 25 years. 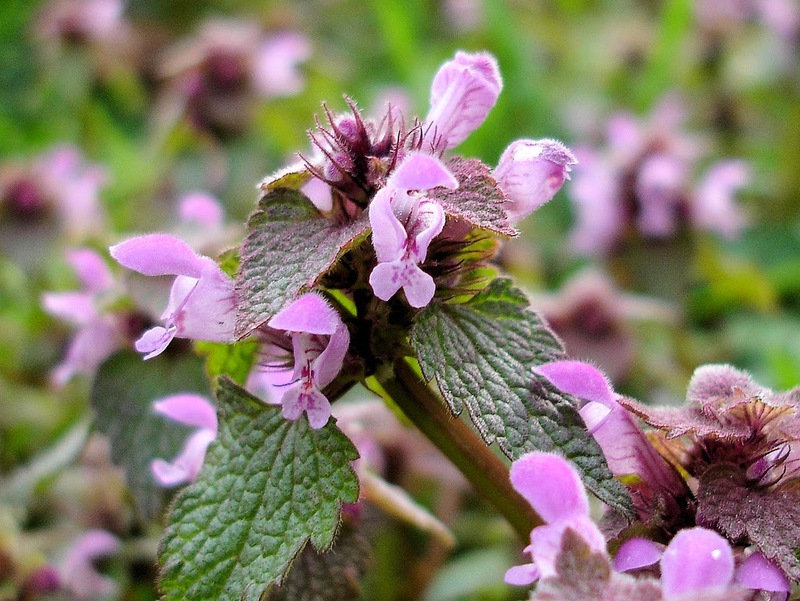 Henbit deadnettle is an edible herb and has a sweet, mild taste. Spotted deadnettle is so-called because its leaves can be variegated. 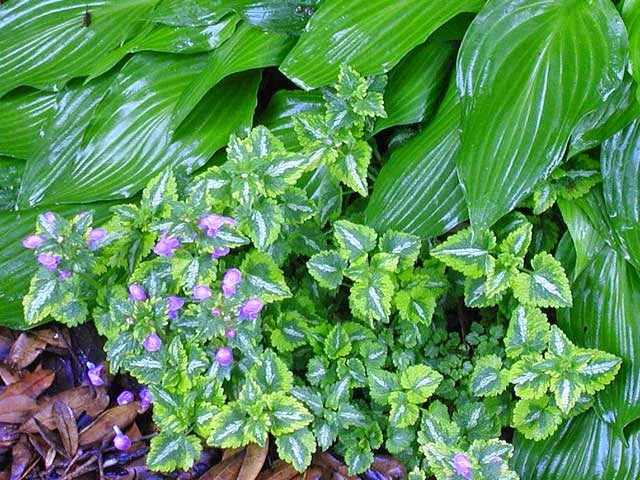 However the plant is highly variable in form and colour. 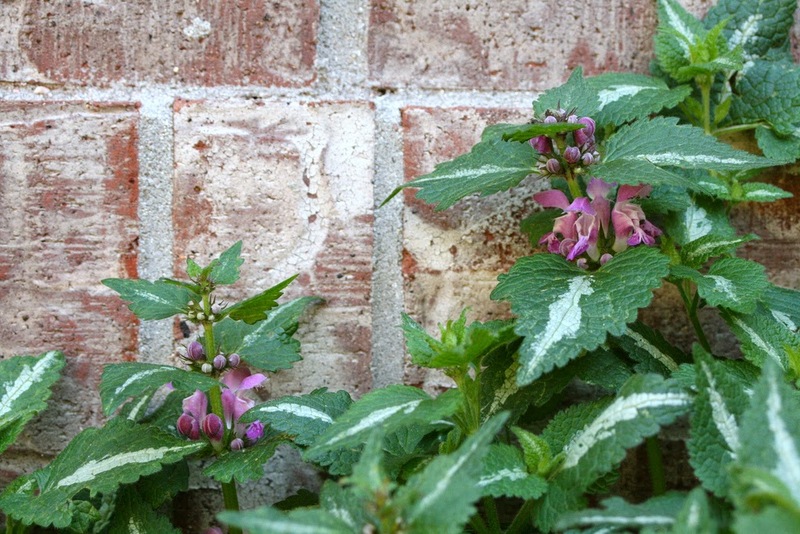 The variability of spotted deadnettle makes it extremely popular with gardeners. There are many cultivars. 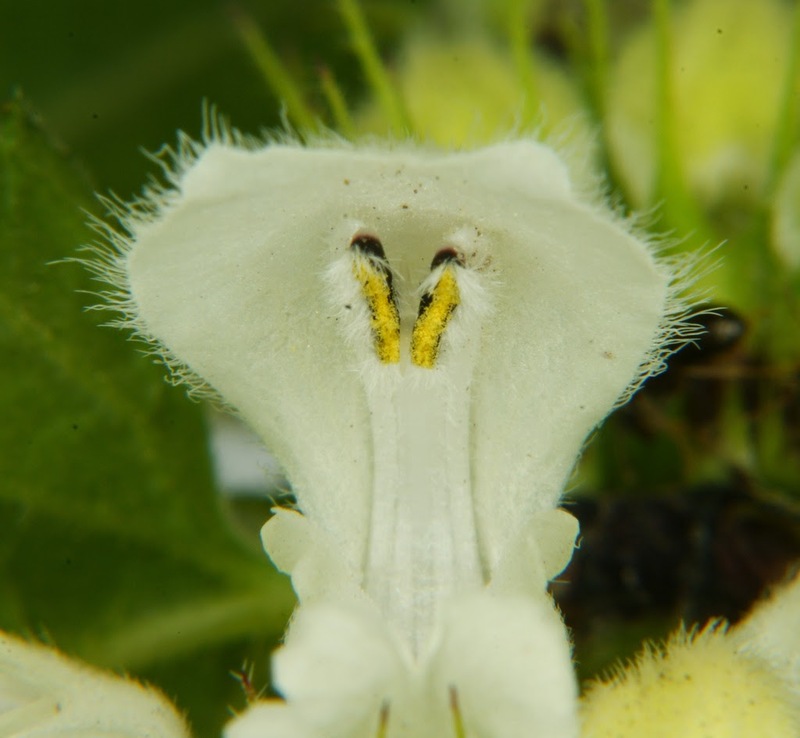 White deadnettle has a very special adaptation. A whorl of hair on the white deadnettle flower lets in bees, but keeps out smaller insects (useless for pollination) which are not strong enough to push it aside. 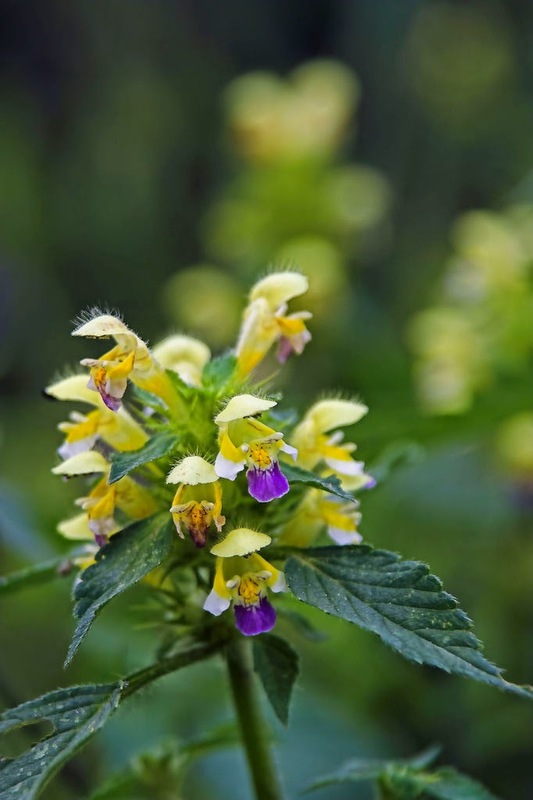 NB: You may have noticed that one species of deadnettle not featured in this blogpost is yellow archangel, Lamium gelobdolon. But don’t worry, I plan to give this a post of its very own in the future.